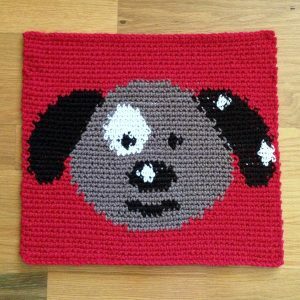 Big Boy Blanket – #6 Puppy! 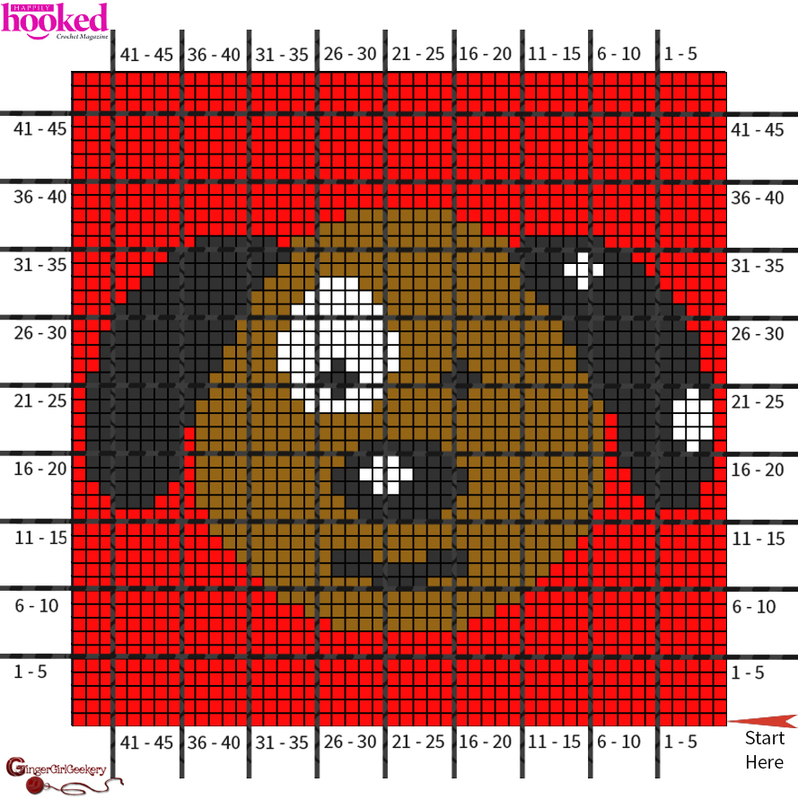 Our 6th square of the Big Boy Blanket is an adorable, brown puppy! We love the little spots on his eye, nose, and ear. So cute! Have fun with this block and don’t forget to share your progress on Social Media with the hashtag #HappilyHooked! If you missed the first 5, you can find the Rocket square here, the Sports square here, the Lion square here, the Car square here, and the Firefighter square here. Yarn: Worsted weight yarn: 1 skein each of Red (A), Brown (B), Black (C), White (D). Row 8: With A, sc 19. With B, sc 10. With A, sc 19. Row 9: With A, sc 17. With B, sc 14. With A, sc 17. Row 10: With A, sc 15. With B, sc 18. With A, sc 15. Row 11: With A, sc 14. With B, sc 8. With C, sc 4. With B, sc 8. With A, sc 14. Row 12: With A, sc 13. With B, sc 6. With C, sc 10. With B, sc 6. With A, sc 13. Row 13: With A, sc 12. With B, sc 7. With C, sc 3. With B, sc 4. With C, sc 3. With B, sc 7. With A, sc 12. Row 14: With A, sc 11. With B, sc 26. With A, sc 11. Row 15: With A, sc 10. With B, sc 28. With A, sc 10. Row 16: With A, sc 10. With B, sc 11. With C, sc 6. With B, sc 11. With A, sc 10. Row 17: With A, sc 2. With C, sc 4. With A, sc 3. With B, sc 11. With C, sc 8. With B, sc 11. With A, sc 3. With C, sc 3. With A, sc 3. Row 18: With A, sc 2. With C, sc 5. With A, sc 2. With B, sc 10. With C, sc 3. With D, sc 2. With C, sc 5. With B, sc 10. With A, sc 2. With C, sc 5. With A, sc 2. Row 19: With A, sc 1. With C, sc 6. With A, sc 2. With B, sc 10. With C, sc 4. With D, sc 4. With C, sc 2. With B, sc 10. With A, sc 1. With C, sc 7. With A, sc 1. Row 20: With A, sc 1. With C, sc 7. With A, sc 1. With B, sc 11. With C, sc 2. With D, sc 2. With C, sc 4. With B, sc 11. With A, sc 1. With C, sc 7. With A, sc 1. Row 21: With A, sc 1. With C, sc 1. With D, sc 1. With C, sc 5. With A, sc 1. With B, sc 12. With C, sc 6. With B, sc 12. With A, sc 1. With C, sc 7. With A, sc 1. Row 22: With A, sc 1. With C, sc 7. With A, sc 1. With B, sc 30. With A, sc 1. With C, sc 4. With D, sc 3. With A, sc 1. Row 23: With A, sc 1. With D, sc 3. With C, sc 4. With A, sc 1. With B, sc 30. With C, sc 8. With A, sc 1. Row 24: With A, sc 1. With C, sc 8. With B, sc 8. With D, sc 5. With B, sc 17. With C, sc 5. With D, sc 3. With A, sc 1. Row 25: With A, sc 1. With C, sc 1. With D, sc 1. With C, sc 7. With B, sc 9. With C, sc 1. With B, sc 5. With D, sc 3. With C, sc 1. With D, sc 3. With B, sc 6. With C, sc 9. With A, sc 1. Row 26: With A, sc 1. With C, sc 9. With B, sc 6. With D, sc 2. With C, sc 3. With D, sc 2. With B, sc 4. With C, sc 3. With B, sc 8. With C, sc 9. With A, sc 1. Row 27: With A, sc 2. With C, sc 9. With B, sc 8. With C, sc 1. With B, sc 4. With D, sc 4. With C, sc 1. With D, sc 4. With B, sc 4. With C, sc 9. With A, sc 2. Row 28: With A, sc 2. With C, sc 9. With B, sc 4. With D, sc 9. With B, sc 13. With C, sc 9. With A, sc 2. Row 29: With A, sc 2. With C, sc 10. With B, sc 12. With D, sc 9. With B, sc 3. With C, sc 10. With A, sc 2. Row 30: With A, sc 3. With C, sc 9. With B, sc 4. With D, sc 7. With B, sc 13. With C, sc 9. With A, sc 3. Row 31: With A, sc 3. With C, sc 10. With B, sc 12. With D, sc 7. With B, sc 3. With C, sc 10. With A, sc 3. Row 32: With A, sc 4. With C, sc 9. With B, sc 4. With D, sc 5. With B, sc 12. With C, sc 10. With A, sc 4. Row 33: With A, sc 5. With C, sc 5. With D, sc 1. With C, sc 4. With B, sc 12. With D, sc 3. With B, sc 4. With C, sc 9. With A, sc 5. Row 34: With A, sc 6. With C, sc 9. With B, sc 18. With C, sc 3. With D, sc 3. With C, sc 3. With A, sc 6. Row 35: With A, sc 7. With C, sc 3. With D, sc 1. With C, sc 5. With B, sc 16. With C, sc 9. With A, sc 7. Row 36: With A, sc 9. With C, sc 6. With A, sc 1. With B, sc 16. With A, sc 1. With C, sc 6. With A, sc 9. Row 37: With A, sc 18. With B, sc 12. With A, sc 18. Row 38: With A, sc 20. With B, sc 8. With A, sc 20.